The Silk Cotton or Ceiba Tree [Ceiba pentandra (L.) Gaertn.] 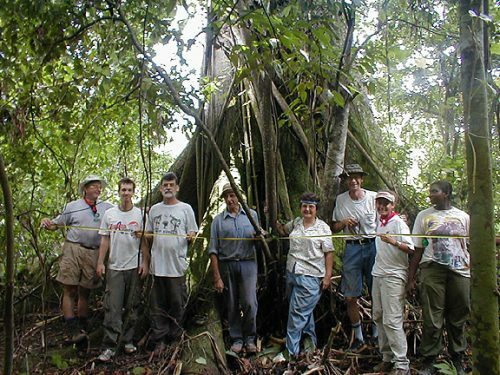 is one of the largest trees in the American tropics. The tree has played an important role in the spiritual and economic lives of the peoples who live in the circum-Caribbean region. 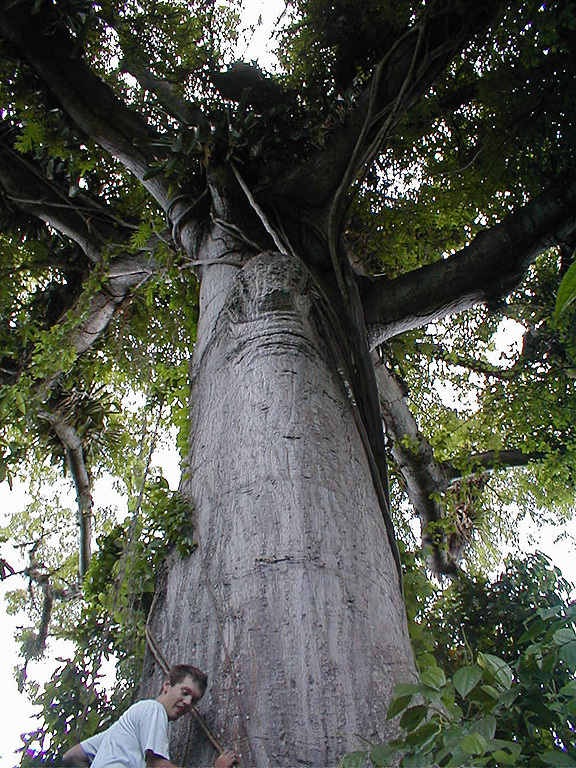 The Ceiba is a rapidly growing deciduous tree that reaches heights of 80 feet or more, and a diameter of five to eight feet above its buttresses. The buttresses themselves can be up to ten feet tall and extend ten feet from the main trunk. The tree has a broad, flat crown of horizontal branches. The leaves are compound with five to eight lance-shaped leaflets that are three to eight inches long. From December to February the tree produces numerous five-part whitish to pink flowers which occur in dense clusters and bloom before the leaves appear. The tree produces three-to-six-inch long, elliptical fruits. These fruits contain many seeds surrounded by a dense mat of cottony fibers. The tree gets its common name from these fibers which rain from the tree when the fruits ripen. The fibers are almost pure cellulose, buoyant, impervious to water, and have a low thermal conductivity, but they do not lend themselves to spinning. 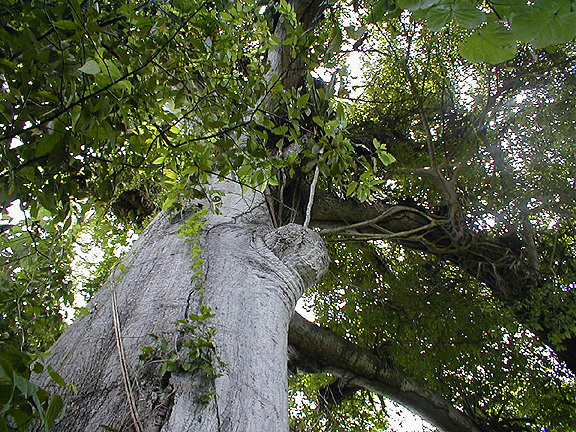 Called Kapok in Asia, the fibers are used for insulation, padding in sleeping bags and life preservers, and for stuffing mattresses and pillows. In Puerto Rico the tree was often planted in the center of plazas for shade, and it is considered a valuable honey tree. 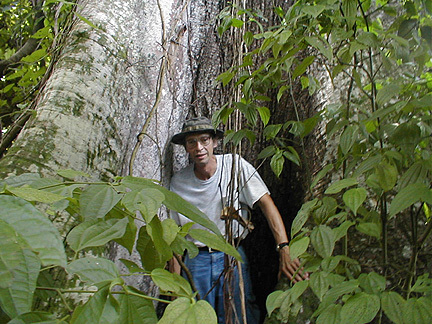 Bob Gezon emerges from a cavity in the huge buttress. The tree in these photographs is growing on the Sweetwater archaeological site, Paradise Park, Westmoreland, Jamaica. All around the base of the tree there are broken pieces of pottery, shells, and stone from a Taino village that was occupied during the 15th to 16th centuries. Bill Rogers, a forester from Tallahassee, Florida, examined the tree while volunteering on an archaeological research project. Bill concluded that the tree was now about 85 feet tall, although it had been topped (the top had broken off in a storm sometime in the past). Furthermore, the tree was about 8 feet in diameter above the buttresses, and we measured the width of the tree with buttresses as more than 20 feet at ground level. Bill estimated that the tree is 200 to 300 years old. While working at the site in 2002, a local volunteer noticed that the tree appeared to be smoking. Part of the mythical qualities associated with these trees? From left: Bill Rogers, Dan Keegan, Bill Keegan, Ralph Pax, Mary Lou Pax, Bob Gezon, Nadia Manning, and Leslie-Gail Atkinson measuring the Ceiba tree at Wes15b. According to Hernandez Aquino (1977), Ceiba (pronounced “sayba”) is a Taino word. Christopher Columbus in 1492, and Gonzalo Fernandez de Oviedo in 1526, were both impressed by the size of the canoes that the Indians in the West Indies and coastal Central and South America made from the Ceiba tree. These canoes (another Taino word) were hollowed out of tree trunks all in one piece. Some were 10 to 12 spans wide (a “span” measures 9 inches or 1/8th of a fathom), and could carry more than 100 men. The wood is exceedingly lightweight (specific gravity = 0.23), and is easily worked. However, because the wood lacks durability and is susceptible to insects and decay, it is not used for other kinds of construction. 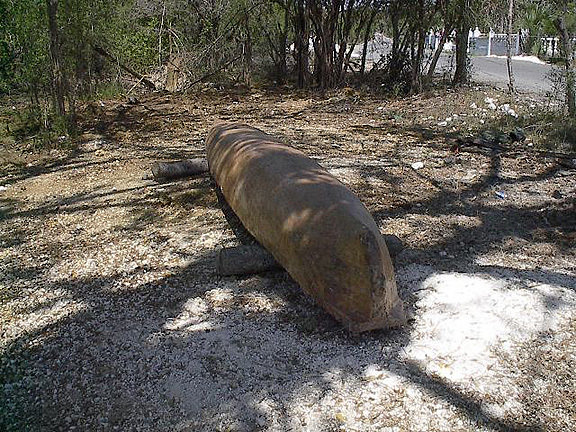 Dugout canoes, like the one below, are still made today from Ceiba trees. 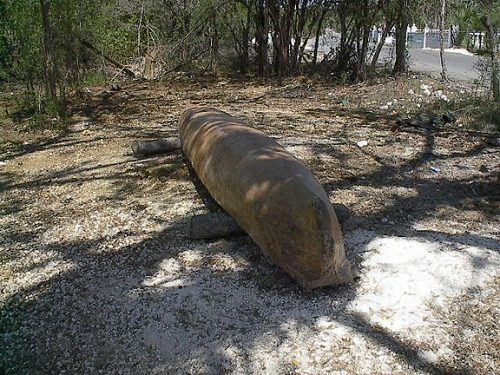 Dugout canoe made from a Ceiba tree, Black River, Jamaica. José Juan Arrom suggested that this spirit who constantly sought the woods, where the the opías or spirits of the dead dwelt, served as the daylight guardian. Greek mythology assigned a similar role to Cherberus, the three-headed dog who stood at the river crossing that marked the entrance into the realm of Pluto. In line with Arrom’s conclusions, Antonio Stevens-Arroyo identifies Opiyelguobirán as one of the twins who assist Maquetaurie Guayaba. Maquetaurie Guayaba was the Lord of the Dead, Master of Sweetness and Delight, symbol of the guayaba berry (whose juice produced a black body paint which symbolized death), Lord of Coaybay (“the house and home of the dead”); he was represented by bat symbols. Opiyelguobirán as Guardian of the Dead and Master of Privacy and Felicity, was the twin of Corocote, Guardian of Sexual Delight, Romance, and Spontaneity, he was a picaresque spirit. However, this is only one of the ways that Opiyelguobirán was represented. As Henry Petitjean Roget points out, “Zemis (or cemíes) are not specific representations but symbolic entities…like many symbols, [they] cannot be reduced to a single interpretation.” Petitjean Roget associates Opiyelguobirán with the discovery of the first wild bee honey. As such, he is a metaphor for the power of the cacique (chief). Image of Opiyelguobirán the Taino Cemí (spirit) who guarded the world of the dead. 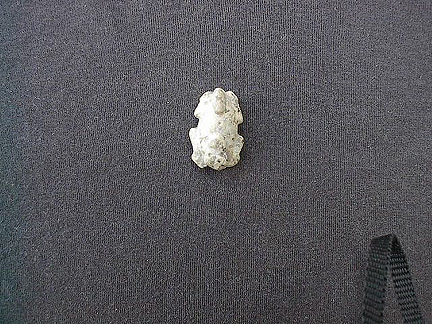 This amulet was discovered in a 9th century archaeological site at Paradise Park, Jamaica. Various beliefs in supernatural spirits were brought to the West Indies from Africa by enslaved peoples. It is likely that these beliefs also were influenced in the 16th century by the last remaining native peoples One of the modern words for spirits of the dead in the West Indies — Obeah — may originally have come from the Taino name (see Zombi for another example). Arrom, José Juan (1975). Mitología y Artes Prehispánicas de las Antillas. Siglo Veintiuno Editores, Mexico. Dunn, Oliver and James E. Kelley, Jr. (1989). The Diario of Christopher Columbus’s First Voyage to America 1492-1493. University of Oklahoma Press, Norman. Hernandez Aquino, Luis (1977). Diccionario de Voces Indigenas de Puerto Rico. Editorial Cultural, Rio Piedras. Hurston, Zora Neale (1938). Tell My Horse: Voodoo and Life in Haiti and Jamaica. Perennial Library Edition (1990), New York. Little, Elbert L., Jr. and Frank H. Wadsworth (1964). Common Trees of Puerto Rico and the Virgin Islands. Agriculture Handbook No. 249, U. S. Department of Agriculture, Forest Service, Washington, D.C.
Oviedo, Gonzalo Fernandez de (1526). Natural History of the West Indies. Translated and Edited by Sterling A. Stoudemire (1959), University of North Carolina Press, Chapel Hill. Pané, Ramón (1498). Relación Acerca de las Antiguedades de los Indios. Edited by J. J. Arrom (1974), Siglo XXI, Mexico. Petitjean Roget, Henry (1997). Notes on ancient Caribbean art and mythology. In The Indigenous People of the Caribbean, Edited by Samuel M. Wilson, pp. 100-108, University Press of Florida, Gainesville, 1997. Stevens-Arroyo, Antonio (1988). Cave of the Jagua: The Mythological World of the Tainos, University of New Mexico Press, Alburquerque.